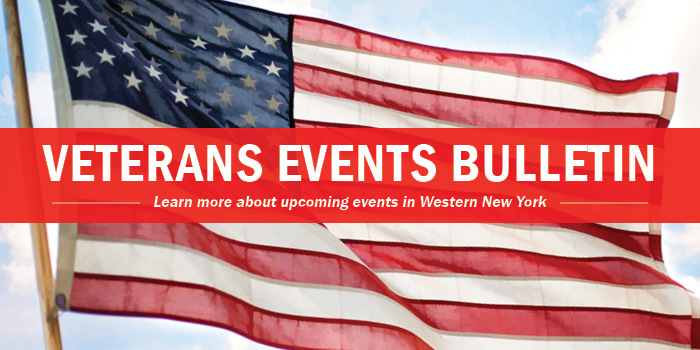 Veterans Events Bulletin :: Headway of WNY, Inc.
Veterans will show off their artistic talents through VA Western New York Healthcare System’s Recreation Therapy’s winter Veterans Creative Arts Festival on Thursday, February 28, 2019. The festival kicks-off at VA WNY Healthcare System, 3495 Bailey Avenue in Buffalo from 11am in Room 301, Freedom Hall and concludes at 2pm. Veterans enrolled in VA health care, have entered their work in visual arts division categories such as oil painting and leatherwork, and/or performing arts categories, to include music, drama, dance, comedy, and creative writing. VA medical facilities hold local competitions across the nation into their respective Recreation Therapy programs. This annual national competition recognizes Veteran progress and personal recovery made through recreation therapy, and raises the visibility of the creative achievements of our nation’s Veterans after disease, disability, or life crisis. Winners in each of the categories of the local recreation therapy programs will go on to the 2019 National Veterans Creative Arts Festival level of competition in Ann Arbor, Michigan. This local Creative Arts Festival is part of VA’s celebration of National Therapeutic Recreation Month, celebrated in February. Throughout the year, recreation therapy activities are offered to Veterans such as creative arts, sled hockey, fly fishing, outrigger canoeing and more, to improve quality of life by enhancing and maintaining motor, physical, social, and cognitive functioning. These therapies provide opportunities to build confidence, develop coping skills, and integrate the skills learned in treatment settings into community settings. For more information on VA Recreation Therapy programs, please call Pam Kaznowski at 716-862-6814. On Friday, March 1, 2019, veterans with disabilities will be treated to a fun day of skiing as part of VA Western New York Healthcare System’s Recreation Therapy activities and hosted by the Lounsbury Adaptive Ski Program at Holiday Valley Ski Resort in Ellicottville, New York. The ski program will kick-off from the Tannenbaum Lodge at Holiday Valley. Veterans enrolled in VA health care are welcome to participate and can register by calling 716-862-6814. Ski passes and equipment are generously donated by Lounsbury Adaptive Ski Program at Holiday Valley. Disabled veterans can take part in stand up or adaptive skiing at no cost. Media opportunity is at 10am at Tannenbaum Lodge at Holiday Valley. Are you interested in learning about photography? There are four FREE 12-week intensive photography courses for post 9/11 combat veterans beginning in January 2019. All supplies, instruction and equipment will be provided free-of-charge and - at the completion of the training you will keep the hi-end Canon camera you learned to use! This program is sponsored by CEPA Gallery and the Veterans One-stop Center of WNY. The workshops will conclude with an exhibition at CEPA Gallery and a book. Space is limited. If you or someone you know, including veteran’s caregivers, are interested to taking this journey, please contact wearedwyer@vocwny.org with ‘The Odyssey Workshops’ in the subject line to apply. PTSD Support Group - meets every Saturday at 1pm at the UCAN Men's Mission on 1st Street in Jamestown. Chautauqua County Veterans Service Agency Bus transports Veterans to VAMC Buffalo on Wed and Friday. Thursday (once a month). Various pick up points throughout the county. Please try to call at least 2 wks in advance to schedule. Contacts: 665-6466 Jamestown area, 366-4500, Dunkirk area, 1-800-388-6534. Creative Expression, Music and Art Group - offered by a partnership between Buffalo Vet Center and Veterans One-stop Center of Western New York, Inc., Share your experiences through art (no prior musical or artistic experience required). - First and third Mondays of each month, 4 - 6pm, at Veterans One-stop Center of WNY, Inc., 80 Professional Parkway, Lockport, NY 14094. Questions may be directed to: Jeff Gramlich (VOC of WNY) at 716-898-0110, ext. 112 or Lauretta Lascu (Vet Center) at 716-862-7350. American Red Cross - Mind-Body Workshops (free) reconnection workshops for service members, veterans, and their family members. To assist with the reintegration process. 2 module options. 60-90 minutes long. Adults only. For further info: contact Lisa Taibi at (716) 878-2371. Phone based Mindfulness Meditation - 2 classes offered each month, first 2 Friday's of the month. Class will be offered via telephone using a toll free number 1-800 767-1750 with Access code 54220#. For information call Debbie Skeete-Bernard, RN, MSN at 1-973-676-1000 ext. 2714. Vetext - an automated, interactive text message system to remind veterans of upcoming appointments and allows responses for confirmation and cancellation. For more information, contact Shawn Gall at 716-862-8556. Employment Program to train Veterans in REALTY. This is a new initiative by a local real estate agency and Erie County Clerk's office on military veterans becoming real estate agents. Metro Roberts Realty will pay 100% for start-up expenses to get a license to sell real estate, including licensing classes and other expenses. In all, cost could exceed $3,000. Veteran Warrior Workout (Free) - Bi-weekly Saturday mornings @ 8:45am. Hotel Lafayette, 391 Washington St., Buffalo, NY 14203 (entrance to gym is on Clinton St.). For additional information, please call Michael at 716-898-0110 x144. Earned Stripes Program: Any veterans interested in becoming a NYS High School Sports Official or Umpire, check website: pdcl@roadrunner.com for more information. Earned Stripes will cover the first year cost of becoming certified. Albright Knox Art Gallery – “Connecting Veterans through Art”- Veterans, spouses or caregivers are welcome to engage in group convo in the galleries followed by a hands-on artmaking experience. First Saturday of the month from 2-4pm. To register contact Karen Duval (716) 270-8249 or kduval@albrightknox.org. Boys/Girls Club (www.bgcbuffalo.org) - free to military families throughout NYS, they offer after school child care with educational programming. 716-825-0023. American Legion Riders – Leek Preserve (provides handicap-accessible camp environment and therapeutic outdoor activities like hunting and fishing). Service members and their families have the opportunity to stay at this site for Free and also use the facilities for their enjoyment. For more information, please contact Oswayo, PA 16915, at 410-322-4610 or www.leekpreserve.org. Military Operation Com - supported by the ECMHA and meet at the VOC (Veteran One Stop Center) a children's program and adults develop coping skills/self confidence and resilency. Twice a month on Fridays, more information call Mary at ECMHA (mcparlane@erieha.org or 716-886-1242 ext. 126) or Jess at 716-640-3258 (jesslafalce@yahoo.com). Greyhound - www.greyhound.com offers 10% off for families, $198 round trip anywhere in the US for military. Warrior to Soul Mate Workshops - Now available in Buffalo and Batavia VA WNYHealthcare System by the Cahplain Service 125P. Call 716-862-6307 to register for this workshop/retreat being conducted for couples in order to reclaim relationships (marriage enrichment). Support and Family Education (SAFE) - Workshop for family members of Veterans offered every other Friday at the VA Medical Center 10AM - 12PM. For more information contact Dr. Elizabeth Wahlig 716-862-7473 (FREE Program). Statler Center Classes and Scholarship - A variety of on-site & distance learning classes. Class topics include: business fundamentals, hospitality, and telecommunications. Full tuition scholarships available. Contact Elizabeth Schmidt at (716) 888-4638. Free Smoke Alarms – American Red Cross. Contact PeralieMae Hargoat 878-2356 or pearllemae.hargo@redcross.org, she will make the arrangements to install them anywhere. Copyright © 2019 Headway of WNY, Inc.